It’s a bit late to say this but, but I want to wish everyone a very Happy New Year! My hope is that the year to come brings you more joy than sorrow, more prosperity than hardship, and enough love and support to help you grow into your best self. On a very sad note, this week my cousin Wayne lost his battle with cancer. Wayne was funny, smart, and big-hearted and he’s left us way too soon. My heartfelt sympathy goes to his family, friends, and loved ones. Among the many other thoughts crowding my head these past few weeks has been the issue of homelessness. Each week, our church opens on Monday to offer shelter to those without homes. We are fortunate that there are many wonderful volunteers who serve as hosts on these nights. For my part, I try to make sure that there is a warm pot of soup available for those weary souls. Over the time that I’ve helped with this mission, I have become familiar with some of our guests and will check in with them if I see them around town. Occasionally, I will buy them coffee or offer a peanut butter sandwich, but I know that even stopping to say hello is important. It demonstrates that these people exist… they are not invisible. A few nights ago, I watched a film called, “Time out of Mind.” In this movie, Richard Gere plays a homeless man in New York City. You don’t know much about what went wrong for his character, but you get a glimpse into how hard it is to be homeless. In one interview, Gere shared that for a scene in the movie he stood on a street corner in Manhattan for 90 minutes begging for change. In that time he received about $1.50 but he said that not one person who gave him money looked him in the eye and no one recognized him at all. Recently, on a bitter cold day, I bought a coffee a local Dutch Bros kiosk. As I was waiting for it to be made, I noticed a homeless person across the parking lot and decided to give it to them. However, by the time I turned my car around, he was gone. Determined to find someone to share this treat with, I headed home scouting for someone in need. When I passed through our downtown, I saw a man with a backpack walking his dog. I wanted to stop but all of a sudden was overcome with this thought “How presumptuous of me to think that he was homeless!” This made me pass him by, but as I’d not seen anyone else around, I gathered my courage and drove back to him. He was a man of about 50 and he walked with a slight limp.With my window rolled down, I asked, “Sir, would you like a latte?” The man stopped and looked at me for a moment before he spoke and then he said, “Yes, thank you, Maam.” I handed it to him and said, “He’s a cute dog.” He said it was a “she” and that’s when he seemed to straighten up and grow taller. Then he stated his full name, and these last words, “US Navy Seal.” I thanked him for his service, and if you know me at all, you know I drove home crying. According to many traditions, today is celebrated as the day the Three Kings visited the Christ Child”; it’s known as the epiphany.” This word is also used to describe “a moment in which you suddenly see or understand something in a new or very clear way.” My wish is, if nothing else, that the next time you see someone on the street, that you not turn away, for there, but for the grace of God, go you or I. Is it Give to Get…. or Get to Give? A few days ago, a man wrote to me to say that he was putting together a book of tales about unselfish acts and he wanted to include my “pie project” in the book. I was honored to be thought of in that light… but what I wanted to say to him was this: I don’t really think that I qualify! Before I explain, let me share a few stories with you. 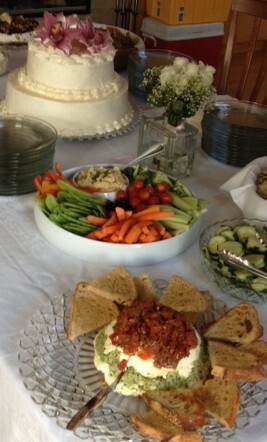 Last summer I was privileged to cater a wedding for a wonderful couple. The reception hall was bustling with activity and with minutes to go before the guests arrived, I took a moment to put the finishing touches on the buffet. Without warning, a woman I’d never met approached me and quietly asked if she could tell me something. “Oh dear!” I thought. “What could possibly be wrong?” and then I turned to her and said, “Sure” hoping that it was a problem I could fix quickly. The woman then told me that I had brought her a pie two years before. When she explained where she worked, her story came back to me. Her friend had recommended her to me because she was a hard worker, extremely considerate to guests, and at the time, she was pretty far along in her pregnancy. I’d tried to bring the pie to her directly, but Ava was busy working somewhere in the hotel and could not be located. That night I left the pie without ever meeting her. 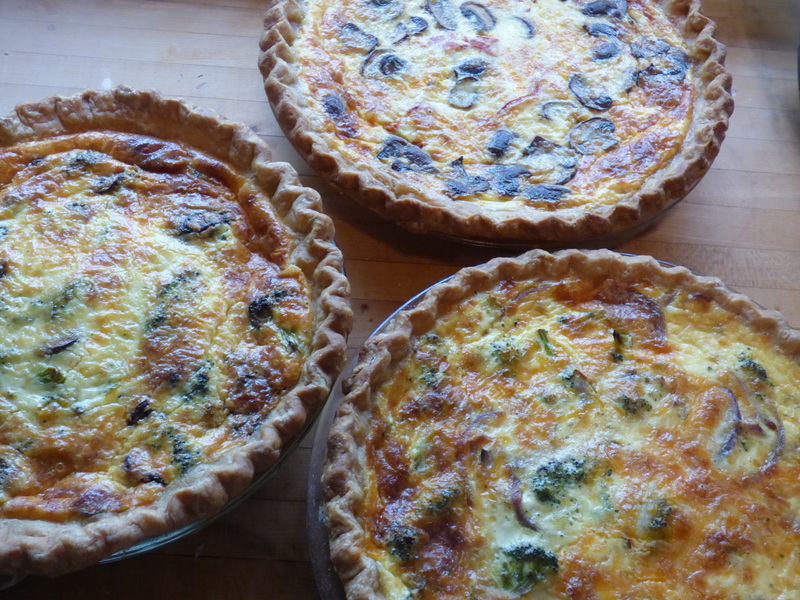 One of my favorite combinations – love and quiches! As Ava told me how much my pie had meant to her, I was overwhelmed with emotion (no surprise, eh?). To be truthful, I still had a full night’s work ahead of me, and was already tired, but I was also deeply touched that my simple gift had had such an impact. Fast forward to a few days ago. 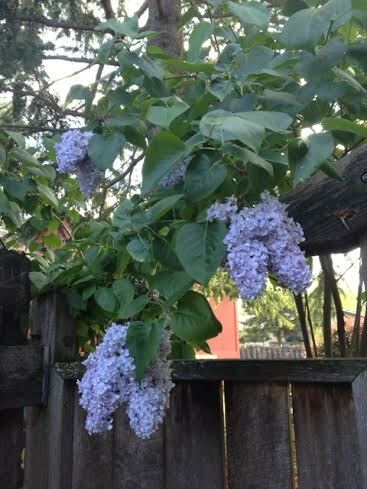 An email arrived with sad news: a friend of my husband’s had lost his wife to cancer. Immediately, we shared our condolences and asked if there was anything we could do. A message came back announcing when the service was to be held. Knowing that we would not be able to attend, I explained that I would like to bring a pie… to show our concern and to give Ron something to share with the family and friends that would soon be with him. My plan had been to bring the pie to Ron’s office and leave it for him, but when I arrived, I found him busy at his desk. I knocked gently on his door and he looked up at me. I could tell that he was trying to figure out how he knew me and so I introduced myself and gave him the pie. Then Ron said something that surprised me… it was something like this, “I’ve aspired to get one of your pies” and then he asked if he could give me a hug. Somehow I found my way out of his workplace without crying, but once outside, my tears flowed freely. I felt so grateful to have acted upon my intuition and given him that pie. Now let’s go back to the beginning of this post and address the word “unselfish.” Over the last few years, I have been on the receiving end of an abundance of good feelings and heartfelt emotions because of this “pie project” that I would not have earned otherwise. Truly, I would not trade those experiences for anything! In a way, I think I have been rather “selfish” because I keep making pies because I really love “getting” those good feelings! We’ll see if my story makes it into the book… but it may not. It really doesn’t matter. What’s more important is that I have been able to share so many amazing moments with friends, family, and strangers because of something that comes naturally to me… and I can’t state this enough: If you are able to give of yourself, do so. You can give no greater gift… and there is no telling the good you may receive! 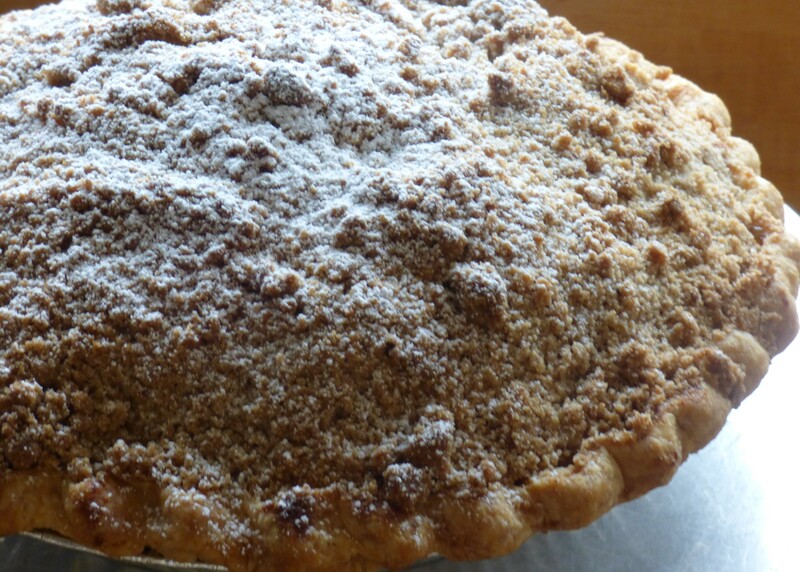 Autumn Arrives… and there are pies (and other treats) in the forecast! Today in Ashland we awoke to gray skies and much cooler weather. How did that happen? Just a few days ago the temperature reached 95 and right now the thermometer is barely hitting 65! Welcome to Fall everyone! That last month of summer quickly slipped by me. Perhaps I was busy but it went by so fast! One minute we were camping and then it was back to school again (not for my kids but still) and the leaves are now changing. Now before I get off on a rant (I know, you’re all thinking, “whew”) let me just share a few of the baked goodies that I managed to squeeze into the last few weeks. One day, Emile and I were on our morning walk when I saw my friend going to her car. I called out “Hi… How are you?” She responded, “Not good. My dog is hemorrhaging. I need to bring him to the vet.” I was stunned into silence and don’t even know if I managed to wave goodbye. As we continued our walk, Emile turned to me and said, “There’s a pie in her future isn’t there?” He knows me so well! This gluten-free cheesecake/pear tart (which was later topped with toasted almonds – sorry, no photo of that) was brought to that woman to let her know that I understood the pain of losing a beloved pet. 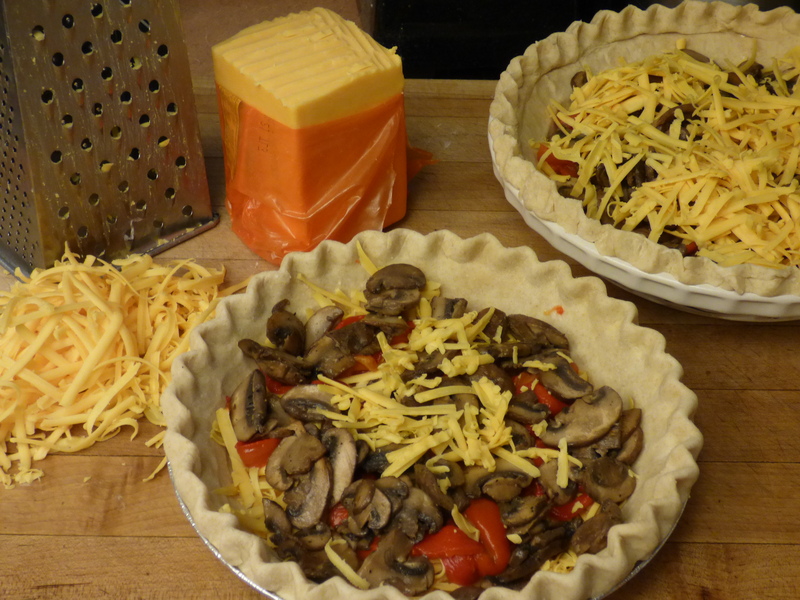 Then there were the quiches… with crimini mushrooms and peppers that I roasted (and what a wonderful scent they left in my kitchen!). One of these was brought to a friend with an ailing partner. My heart aches for them both. 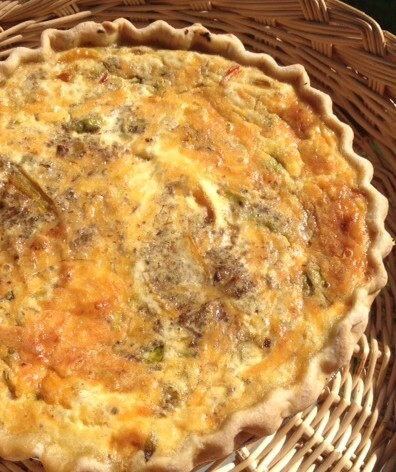 The other quiche was for our new interim pastor (aka Mary Poppins) on the day that she arrived in the valley. It was my hope that by bringing her something homemade she would feel welcomed into our community. These chocolate cupcakes were my contribution to my friend Marie’s birthday party. We laughed trying to decide if they were my version of Ding Dong’s or Ho Ho’s. All I know is that they are simply delicious and deliciously simple to make! 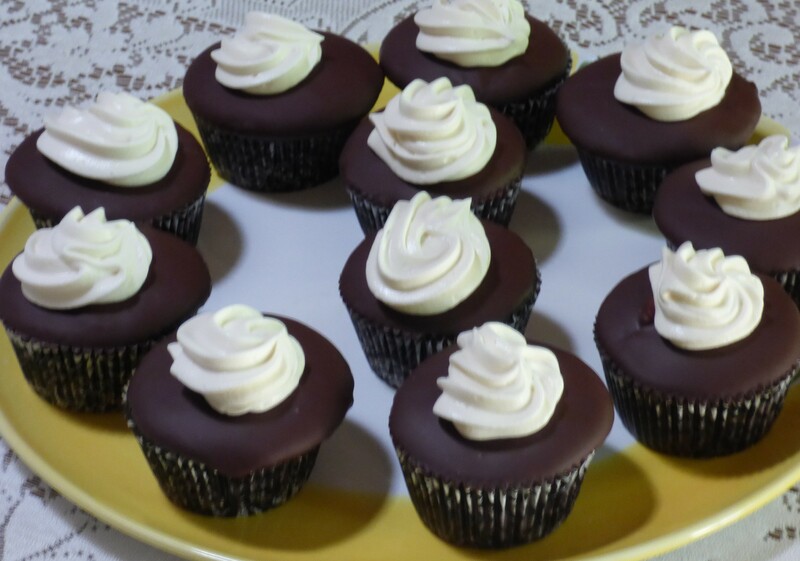 I make my favorite cupcakes, fill them with a squirt of whipped cream, and coat them in chocolate (melted with a bit of coconut oil) and then top with more whipped cream. Yum! 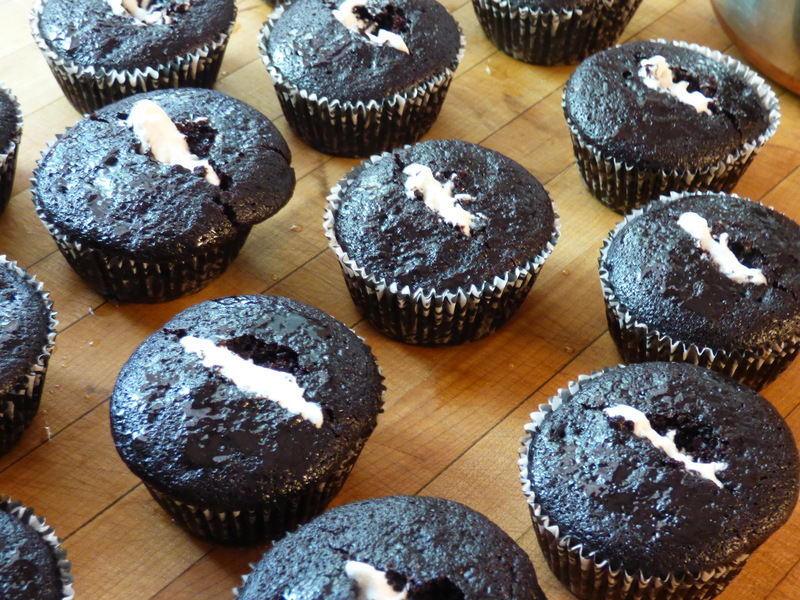 Here is a photo of them midway through the process… I use a paring knife to cut a slit in the top of each cupcake and then a pastry bag to fill the centers with the whipped cream. It’s really easy! By the time you coat them with chocolate and top them with cream, the inside cream becomes a hidden delightful surprise! 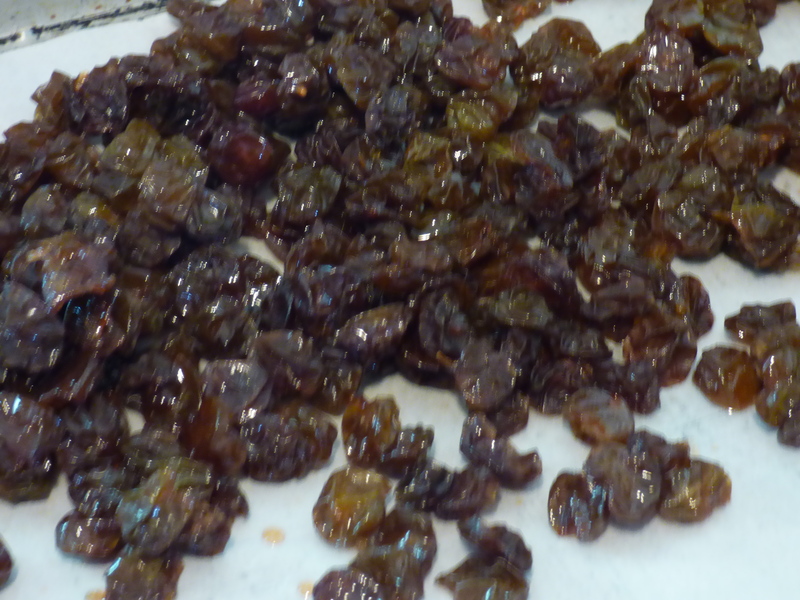 Last week I picked many bowls of delicious grapes at my friend Stella’s house and because I don’t own a food dryer, tried my hand at making raisins in my oven. It took about a day at 175 degrees… and it worked! They are the best raisins I’ve ever had (except maybe for the muscat raisins we used to get at the market in south San Francisco). 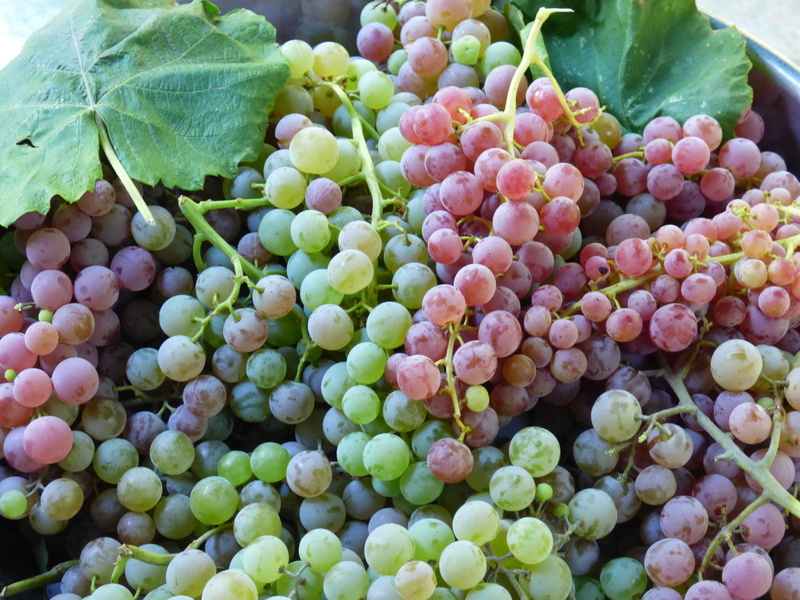 I probably picked 15 pounds of grapes… and they cooked down to about 3 pounds of raisins…. but they are soooooo good! Another treat that I made was for my neighbors, Ellen and Owen. They came home after a very long “vacation” to visit their granddaughter (and her parents of course!) 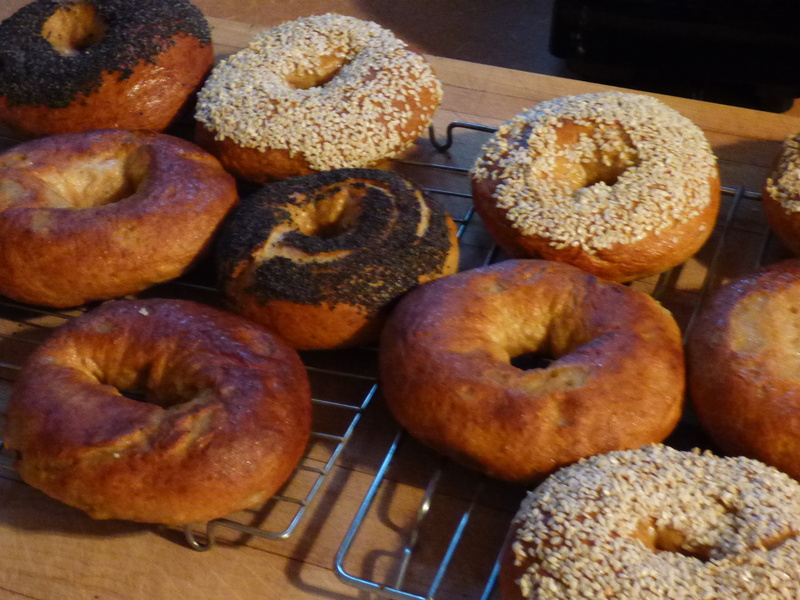 As sweets are out of the question for Owen, I decided to make bagels to remind him of his time in New York. I used this recipe by John D. Lee because it makes bagel making fast (just about 90 minutes) and very easy! These bagels are incredibly tasty; I know because I devoured one minutes after it came out of the oven. Do try this recipe… you won’t be disappointed! 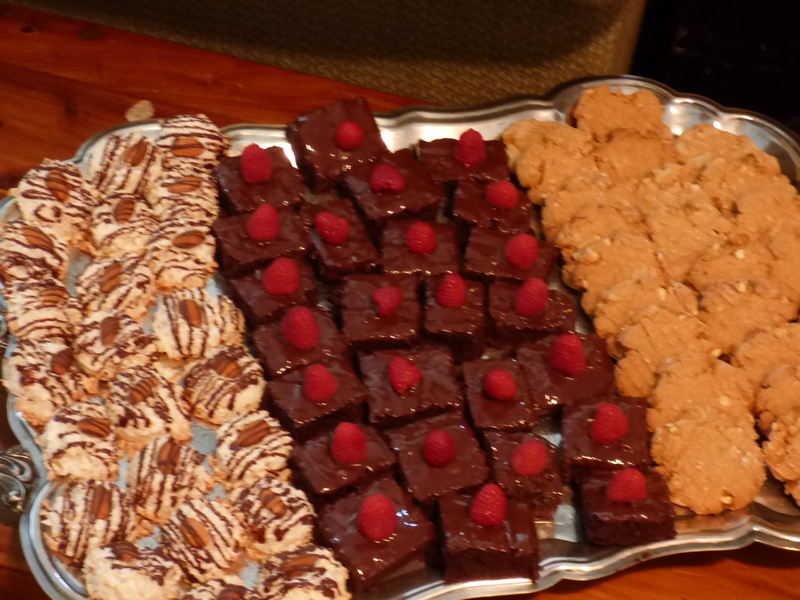 Finally, last Saturday I created a platter of gluten-free sweets (coconut almond macaroons, raspberry-topped brownies, and peanut butter cookies) for supporters of the Ashland Schools Foundation. They were treated to a beautiful event at Bel Fiore Winery and though I am sorry I couldn not attend, I was very happy to contribute. That’s about all I have to share right now. Next time I write I hope to share tales of my visit to see my daughter, Alexandra, for her birthday. She’s been working at Warby Parker since the spring and I am anxious to see New York through her eyes. Til then, I wish you all sweet dreams! The last few weeks have been a bit crazy. My Dad was sent to the hospital once again because he had an infection… and I had a few events to cater. At times it felt like I was barely keeping my head above water, but somehow everything worked out. Dad is home and doing better… and all of my events went well. Yesterday was Mother’s Day and I woke up feeling a little blue. I know that I was lucky to have a mother that loved me… but I still mourn her passing all these years later. I know that I am not alone in sadness. I am very aware that this day is hard for many. There are grieving mothers mourning the loss of a child… and many children mourning the loss of their mother. 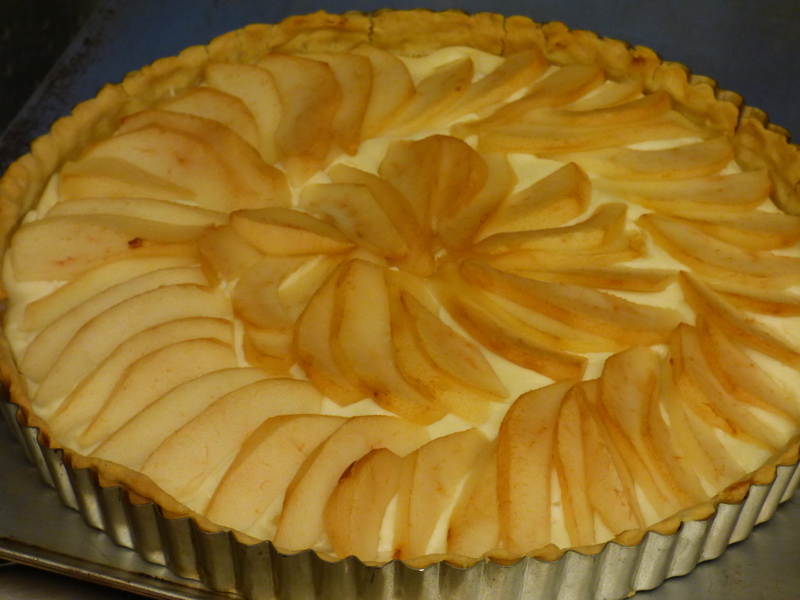 And so while my husband slept I got up and started making pies… it’s something that helps me feel better. 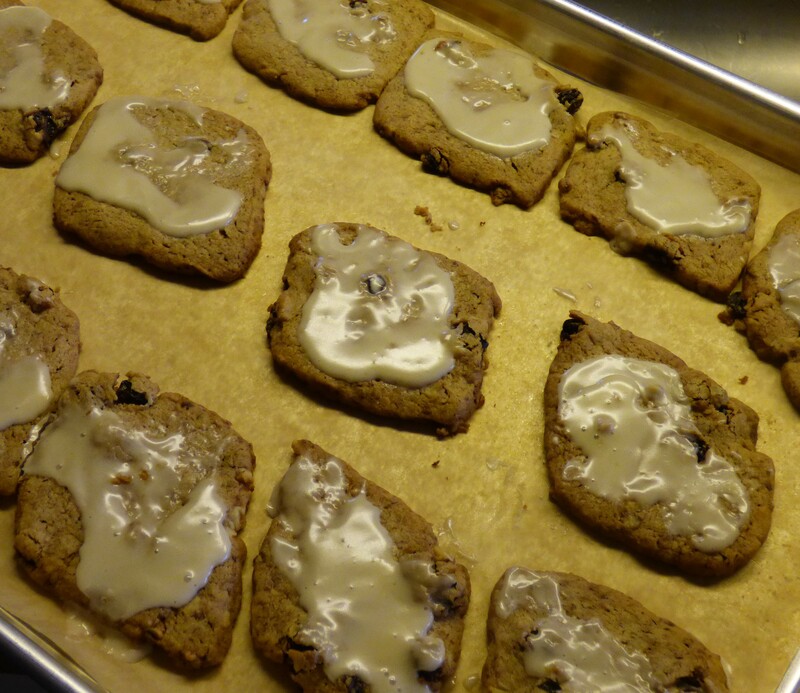 Each of us has our own way of coping… baking just happens to be my way. The first pie that I made was a quiche for a friend of mine who lives nearby. She is not only a mother, but also a grandmother, and she and her husband are raising their special-needs grandson. I admire them both so much for what they are doing… and when I see them with their grandchild, I am humbled by their love and dedication. If more people could be like them, this world would be a much better place. 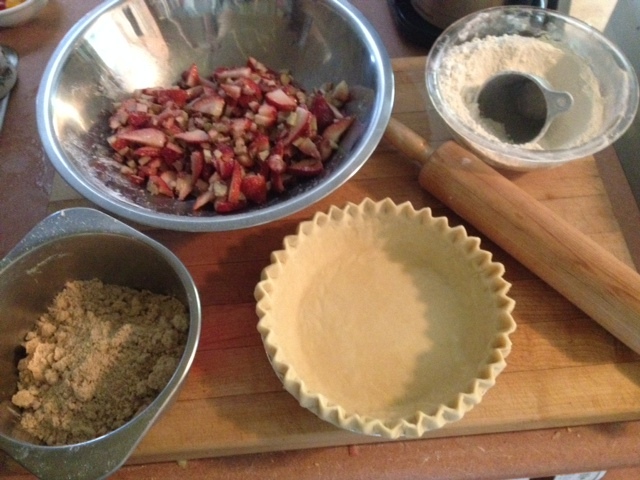 Next I began prepping a Strawberry Rhubarb pie for a man at church who recently celebrated his 97th birthday! Two years ago I baked a cake for him on his 95th birthday, and amazingly he is still going strong. Last week he wasn’t at church because he was attending the 75th reunion of his college class… not surprisingly only one other student made it to that celebration! I am so inspired by this man’s love of life! I just hope that I can live out my years as joyfully. And now I would like to end this post on a very happy note: I want to mention that this week my husband and I are preparing to leave for a long-awaited vacation in Italy. We both have been to Italy before, he when he was just 7 years old, and me when I was 18. Clearly, it has been a very long time… but we are both looking forward to this exciting adventure. And just so you know, I will be packing a few pie tins in my bag… just in case I get the chance to gift a pie! Wouldn’t that be fun? Though I haven’t written in a while, I want you to know that I’m still here and in the last few weeks I’ve made a few pies. 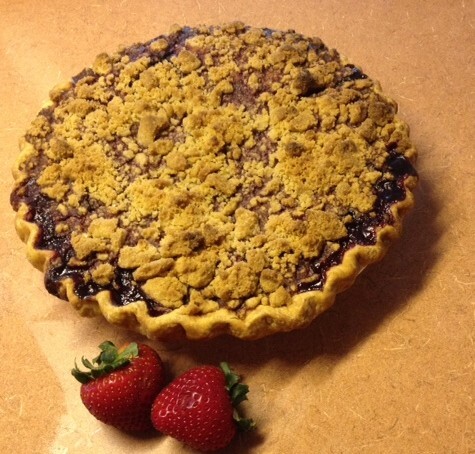 One, a Triple Berry Pie was delivered to a nurse named Nancy at Ashland Hospital. She was very kind to my Dad and I wanted to thank her for all the care that she showed him. 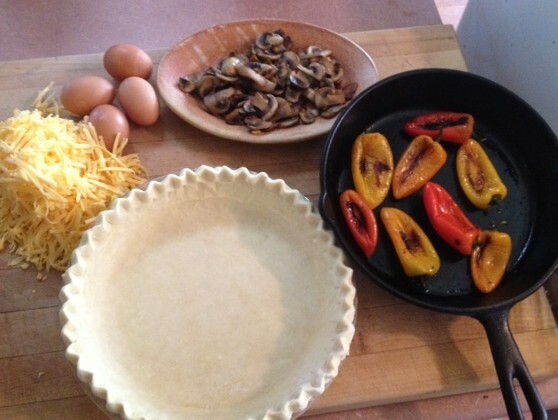 Another, a Mushroom and Pepper Quiche, was delivered to a friend shortly after she returned home from the hospital. It was much appreciated by my friend and it felt good to know that I could help her on her way to recovery. 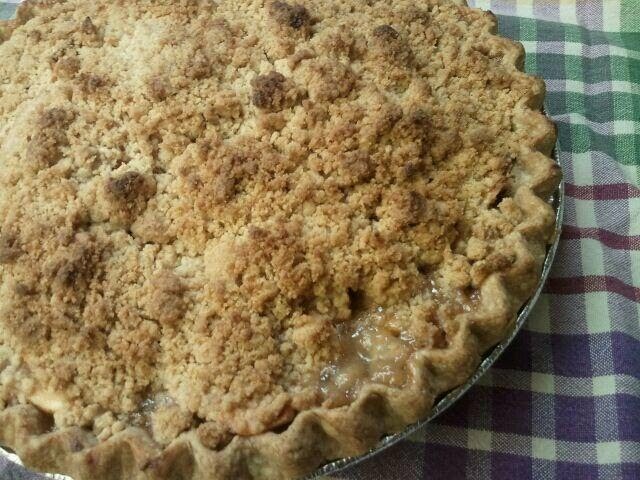 Another pie, my go-to Apple Crumb Crust, was delivered to a woman I met when she was having a yard sale. Her name is Josie and I overheard her saying that she is moving to Guanajuato, Mexico – one of my favorite cities! I was amazed at the idea of her packing up a home that she’s lived in for years and moving to another country. 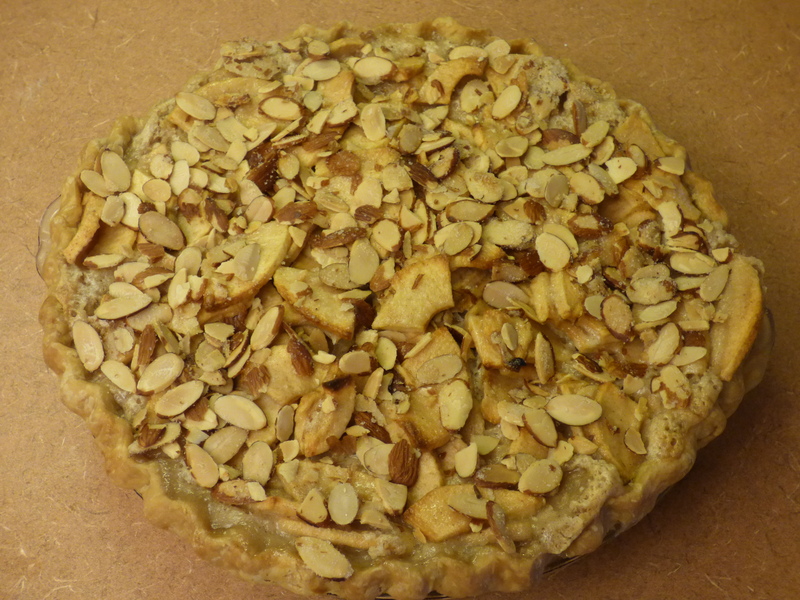 That kind of adventurous spirit certainly needed to be rewarded… and what else would I bring but a pie? 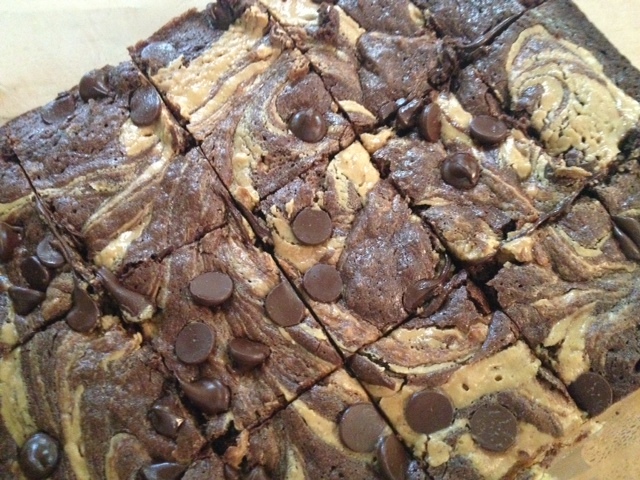 And one day last week I made these delicious Gluten Free Peanut Butter Swirl Brownies to thank my friend Don for coming to my aid when my car battery died at the worst possible time. I made one phone call to his workplace and in just a few minutes he showed up and got my car started. I didn’t have time to bake him a pie (so much going on!) and I hope that these brownies gave him some indication of how grateful I was for his help. 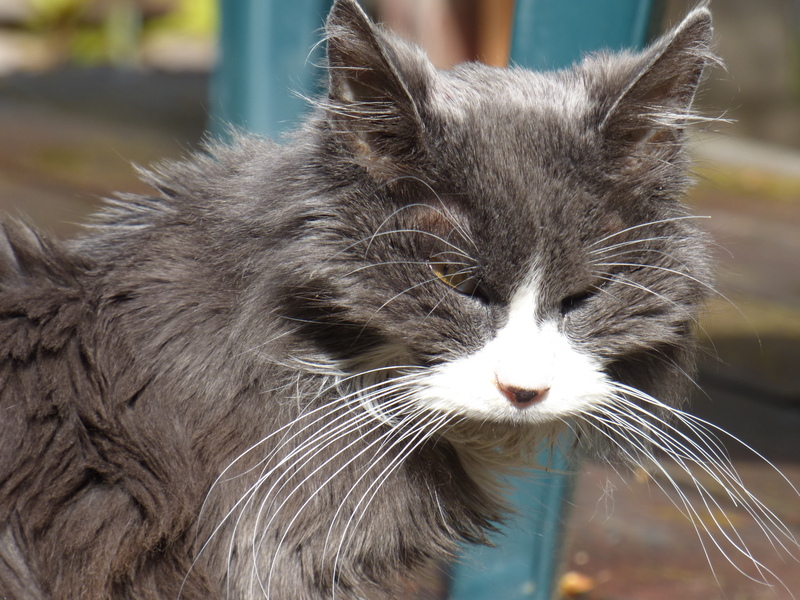 This last week was especially challenging as my dear kitty of 18 years, Pepper, was preparing to leave this world. She was the epitome of grace as she ate less and less, and then not at all. The last few days she sipped only water until that too was unnecessary. In the end, she left peacefully with a final “meow” as I held her close. I feel that we were lucky that she chose our home to come to live in all those years ago… and am grateful for all the time that we had her… but I’m still very sad to see her go. 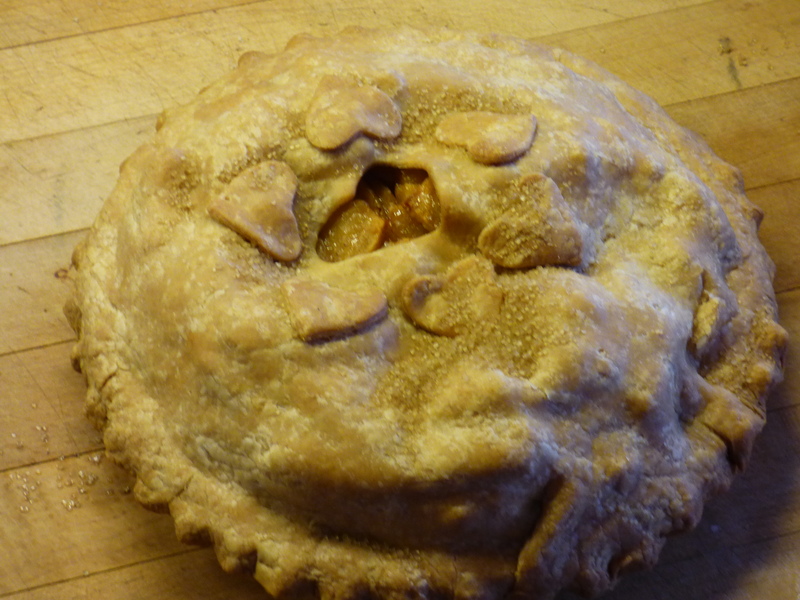 Pi Day… and more pies! This past week has been filled with a variety of pies! 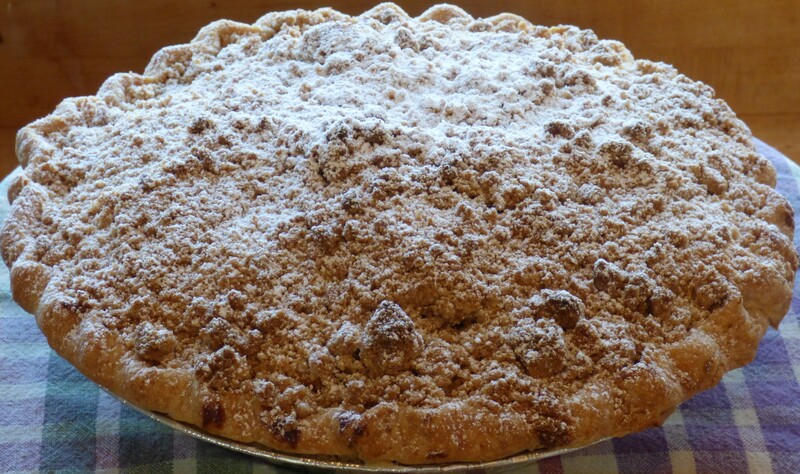 The week began on Sunday when I donated this Apple Crumb Pie to the Schneider Museum of Art as one of the raffle prizes for their annual Bridge and Brunch fundraiser. It’s been my honor to cater this fundraiser for the last few years and I am delighted to serve this great organization. Then on Wednesday I attended my last Italian class for this term. A few classmates offered to bring something to celebrate our “success” thus far with this romance language. One friend made a delicious Tiramisu (which translates to “pick me up)”, while another friend brought along a sparkling beverage to toast our health. 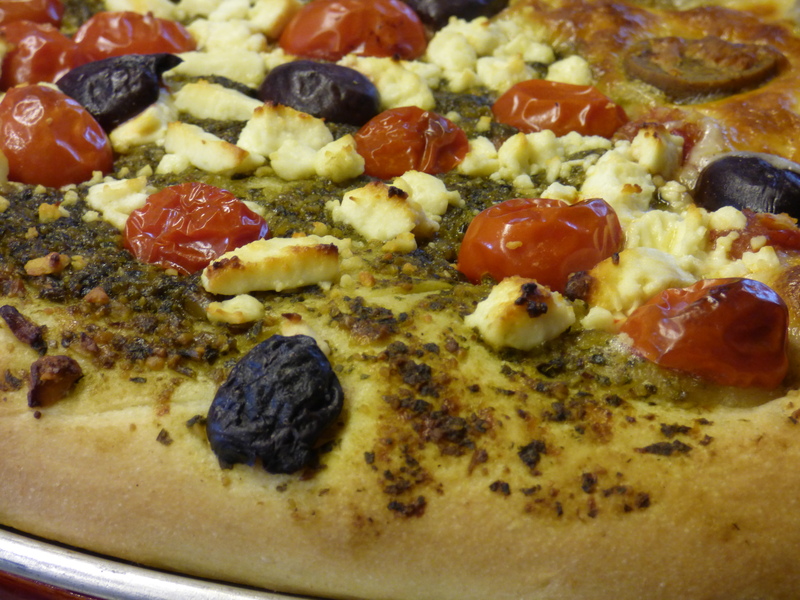 Our lovely teacher brought grilled vegetables (verdure grigliate) and I crafted this vegetarian pizza “pie.” Che divertimento! Before I went to class on Wednesday, I dropped off another Apple Crumb Pie (do you get the feeling that I like making this pie?) to our friend, Noah, who was hosting two Japanese students at his home. The Japanese boys had been hosts to Noah (he went to Japan with the Ashland High School football team last summer) and they’ve kept in touch since then. Noah had extended an open invitation to his hosts to come and visit Ashland and stay at his home and they finally took him up on it! I think it’s really wonderful that these young men are creating a lasting bond. It gives me hope for the future! 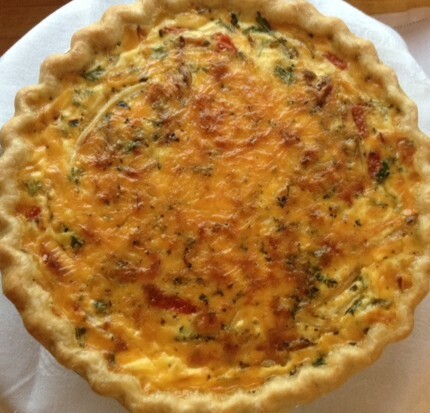 In honor of Pi Day, I brought a quiche to the medical staff who are tending to my Dad. He’s facing some health challenges right now and I wanted to show my gratitude to them for their care and concern. It is most appreciated.